Each cookie gift box comes with a third of a pound of bite-size cookies. The flavors include Cinnamon Sugar, Chocolate Chip, and Peanut Butter Sea Salt. Every Thumbs Cookie is baked fresh in our industrial kitchen with real fresh ingredients, because that is what great-grandma's recipe calls for. Feel good giving your friends, kids, and family a cookie treat that you know was made fresh in a kitchen and not in a factory. One of my most treasured memories as a little girl growing up in Minneapolis was baking with my mom. My mom Barb is the original Thumb-maker. I used to watch her roll this cookie dough into perfect little circles and finish each one with her perfect thumbprint - and I wanted to do it just like her. At first I wasn't so good. But I kept practicing. As I got older I realized that these little cookies we had come to call Thumbs around the house were so much more than addicting delicious treats made for holidays occasions and often upon special request. My mom baked Thumbs as a way to share her love with her family friends and community. They were her signature cookie for neighborhood occasions. Just like my grand-mothers and great-grand-mothers shared their baking and cooking with the ones they loved- this became my mom's thumbprint on our long line of family tradition passed on through food. After watching Barb time and again I finally mastered making Thumbs and decided it was time to share our love and family history with all of you. In honor of the talented caring and inspirational ladies who have made me who I am today - and with Barb's thumbprint of approval - we hope you'll also enjoy Thumbs! FRESH BAKED COOKIES - Each box of cookies is baked fresh by hand by the ladies of Thumbs Cookies. 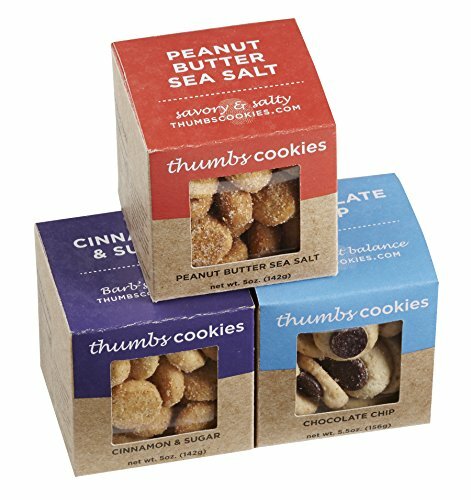 GOURMET COOKIE FLAVORS - Each order comes with three gift boxes. One cookie basket with Chocolate Chip Cookies, one with Cinnamon Sugar Cookies and one with Peanut Butter Sea Salt Cookies. GOURMET GIFT BASKET - Perfect gift box of cookies for him or her for any occasion with a variety that caters to every cookie lover. TRADITION YOU CAN TASTE - Thumbs Cookies recipes have been passed down 4 generations. Now you can endulge in the tradition of thumbs cookies with your family. A great homemade dessert everyone will love. FRESH INGREDIENTS - Thumbs Cookies are made with real fresh ingredients. No Preservatives. Because that's what great-grandma's recipe calls for and that what you can feel confident feeding to your guests, kids, and family. If you have any questions about this product by Thumbs Cookies, contact us by completing and submitting the form below. If you are looking for a specif part number, please include it with your message.